Yandex.Metrica is an analytical tool that helps you find out what users do on your site after clicking your Yandex.Direct ad. You need this information in order to analyze the performance of ads. Yandex.Direct reports in Metrica make it easy to see which ad campaigns, ads, keywords, and search queries brought users to your site, as well as which regions and ad platforms they came from. Use this information to optimize your advertising campaigns. For example, you can improve keywords by adding keywords from the relevant search queries, as well as negative keywords from non-relevant queries. This will help you acquire more engaged users and improve your CTR. In Yandex.Metrica you can get detailed information about your audience. The gender, age, and interests of website users are deduced by using Crypta technology to analyze their online behavior. You can use this data to make ads more relevant and improve their performance. In addition to attracting users to your site, you need to find out whether they become real customers. To do this, set up goals in Yandex.Metrica by identifying key actions that you want website users to complete. Click the “Add to cart” button. Go all the way from the shopping cart to the “Thank you for your purchase” page when placing an order. Visit at least two pages on the site. Register on the site or subscribe to a mailing list. Your configured goals will help you identify which keywords and ads attract users who complete these goals on the site. 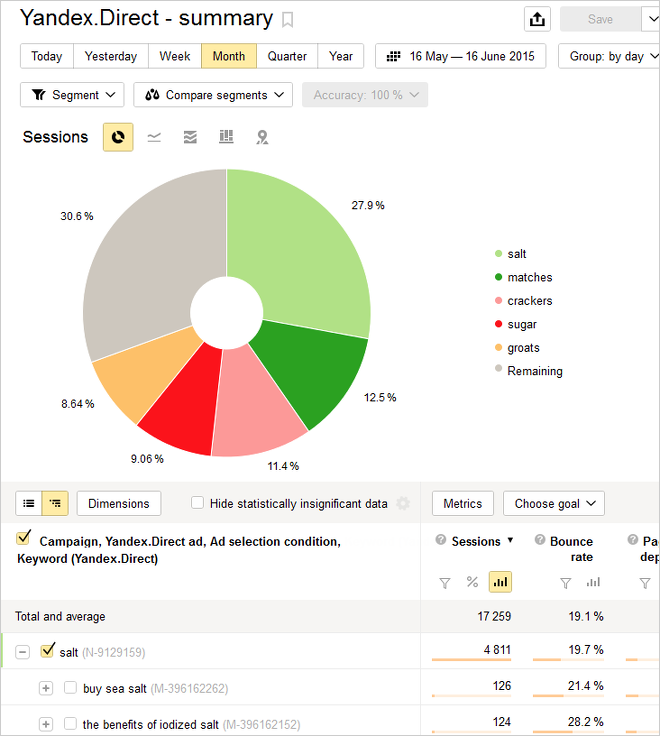 You can analyze the growth of converted sessions and also optimize them by using one of the automatic strategies: Average CPA or Weekly budget: Maximum conversions. Owners of online stores can get detailed information from Yandex.Metrica about each order placed in their online store. You can find out how much money was generated by each order, and which channels produced the most profitable orders. You can quickly evaluate your Yandex.Direct advertising expenses in the Yandex.Metrica interface. For example, you can view overall advertising expenses, find out the average conversion cost for all your ad campaigns, and estimate the average or total cost of clicks for certain device types, regions, search queries, and sites. Customers place orders by phone as well as through the site. The “Target Call” service allows you to compare the performance of different promotional channels. You will get special telephone numbers, which can be associated with different sources, with a level of drilldown that can go as far as individual advertising campaigns. The phone number on the website and on the virtual business card (or vCard) is automatically replaced depending on the source. This means you can find out how the caller discovered you. Create a tag in Yandex.Metrica and set goals for it. Install the code snippet on all pages of your site as close as possible to the start of the page — this will determine how complete the collected data is. You can verify that you have correctly installed the code snippet in the browser console. Fill out the Metrica tags field in your ad campaign's settings in Yandex.Direct. This is sufficient for Yandex.Direct and Yandex.Metrica to interact correctly. If you are creating many campaigns with the same set of tags, you can enter these tags on the user settings page in the Metrica tags for new campaigns field. If you don't specify tag numbers, then the automatic tagging of links can help you transfer data between Yandex.Direct and Yandex.Metrica. Make sure that in your campaign settings you have enabled the Tag links for Metrica option, and your site correctly opens links containing tags. After a user clicks on your ad, the Metrica tag on your site will track the tag and link the session with a specific click. If there are several tags on your site, the sessions and clicks will be accounted for in each of them, so you will need to factor this in when you evaluate how your ads are performing. If clicking through on a yclid tag returns an error, configure your site to use arbitrary URL parameters. If you use redirects, please check that the yclid tag redirects to the destination URL. If you don't have the technical capability to configure your site to work with tagged links, then fill out the Metrica tags field in your campaign settings and disable the Tag links for Metrica option. Attention. If you have not filled out the Metrica tags field in your campaign settings and the Tag links for Metrica option has been disabled, then click data for ads will not end up in Yandex.Metrica, and data from Yandex.Metrica will not end up as Yandex.Direct statistics. How quickly is data updated in Yandex.Metrica reports? User actions on your site are reflected in the majority of reports in Yandex.Metrica in the space of just a few minutes. Data for special Yandex.Direct reports undergoes additional inspection, meaning such reports will only appear in Yandex.Metrica after a few hours. How quickly does the data on completed goals become available in Yandex.Direct? The data on reaching a particular goal becomes available in Yandex.Direct within 24 hours. Why does data in statistics for Yandex.Direct and for Yandex.Metrica differ? Statistics on page depth, conversion indicators, and goal costs from Yandex.Metrica will end up in Yandex.Direct. If your site has several tags installed, then Yandex.Metrica will calculate the data for each tag separately, while Yandex.Direct will provide a total for all tags. Troubleshooting for reports related to “Yandex.Direct”. If you have any other questions regarding Yandex.Metrica, please contact the support service.